The last time my husband and I went out to dinner for Valentine's Day, we sat next to a 50-something man on a date with his 20-something mistress. It was AMAZING. We spent much of the meal listening to him say totally inappropriate things to her while casually referencing his wife and kids. Instead of talking, Eugene and I just spent the meal eating silently so as to not miss any of the scandalous talk at the next table over. Occasionally, we'd widen our eyes or stifle a laugh. Totally hilarious, but not quite the romantic evening we had in mind. Dining out for Valentine's Day can definitely be unpredictable. The food is sometimes amazing, but sometimes it's not. It's pretty much always overpriced and the menus are usually whittled down to a few easy-to-prepare dishes, which may or may not include the things you really want. The restaurants are crowded, the waiters try to hurry you, and sometimes you end up sitting next to crazy people. For the past few years, Eugene and I have opted to skip the fancy dinner out in favor of something fun and lavish at home. We splurge on treats like Champagne, expensive seafood or cuts of meat, good chocolate, and throw ourselves a little party at home. I firmly believe it's totally the way to go. 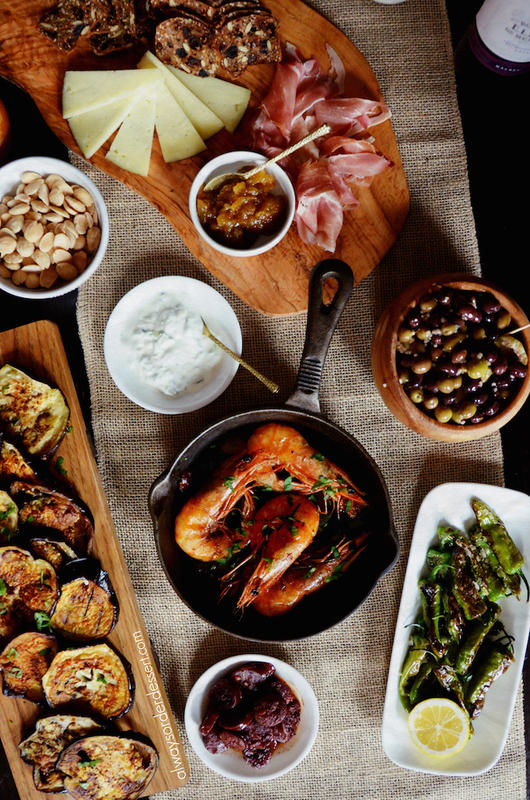 I think a homemade Tapas Party for 2 is an awesome idea for Valentine's Day or any other home celebration (New Year's Eve or a birthday or even just a date night in!). 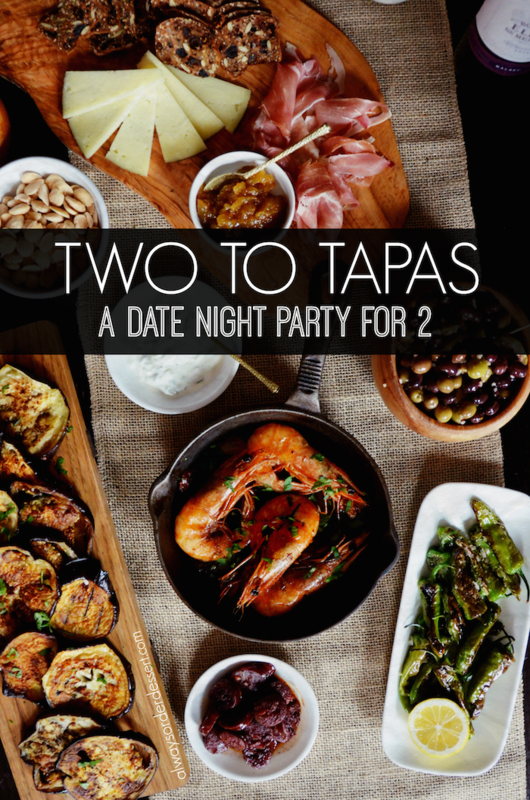 Prepare a variety of small, tasty dishes, open up a bottle or two of wine, and settle in for an amazing night. 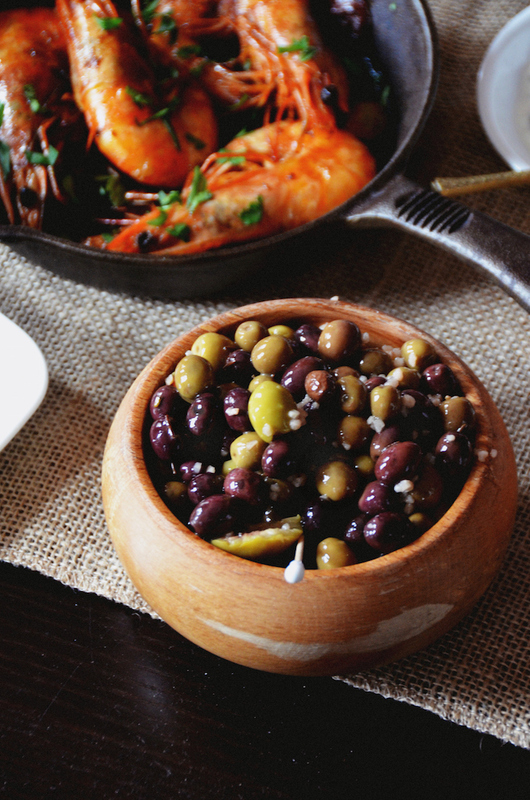 You can really have fun here as there are so many options for a homemade tapas party. I've linked to some of my favorite recipes, but feel free to get creative. No way to go wrong here! A good cheese and charcuterie plate is key. 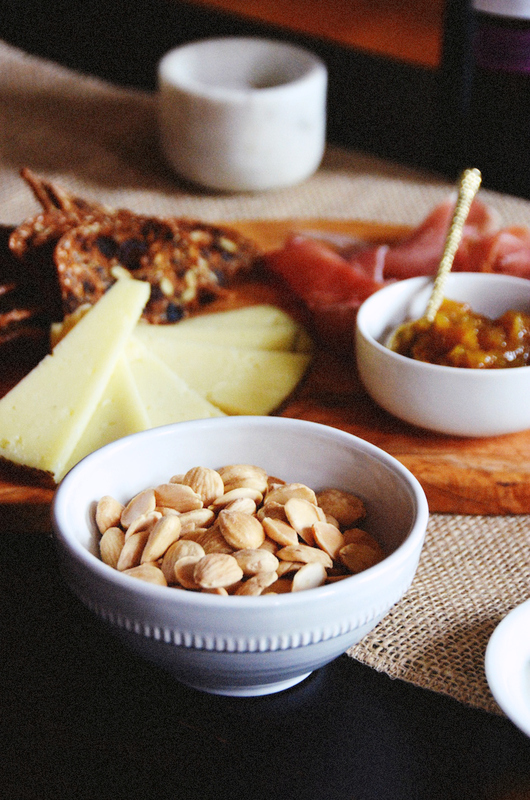 Manchego is a classic aged Spanish cheese that is wonderful with nuts and cured meat. 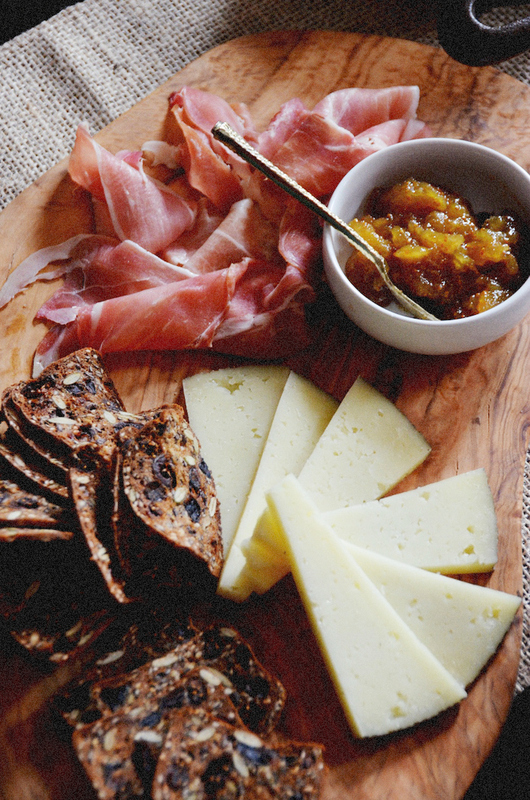 I also love jamon serrano--a cured Spanish ham, though a prosciutto would work, too. If you can find them, roasted and salted Marcona almonds are amazing. These nuts taste like a cross between a regular almond and a hazelnut. They're a bit more expensive than regular almonds, but totally worth the splurge. Serve them on their own for snacking, or sprinkle over a salad. Something sweet is key. Dried fruit, membrillo quince paste, or a fig jam would be lovely with the salty cheese. This is my favorite Homemade Membrillo Recipe. Chorizo is my most favorite Spanish thing ever. 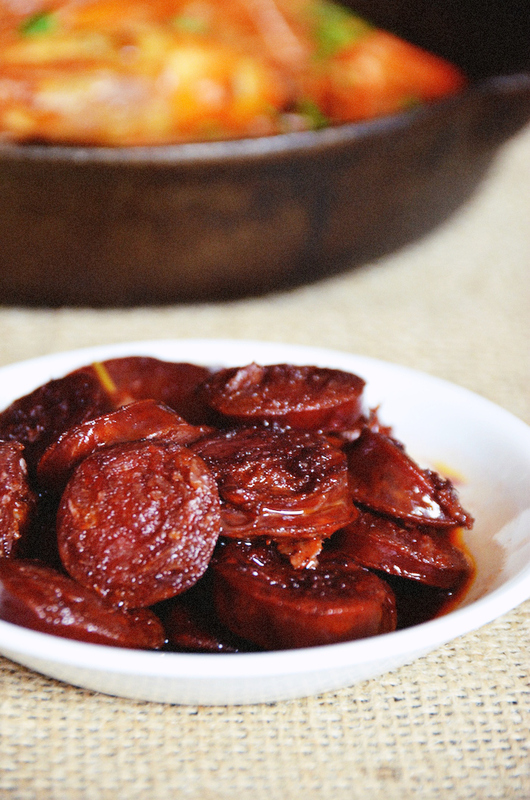 I recommend this ridiculously easy Red Wine Chorizo recipe. Or try making these Puff Pastry Shells filled with Chorizo and Dates! 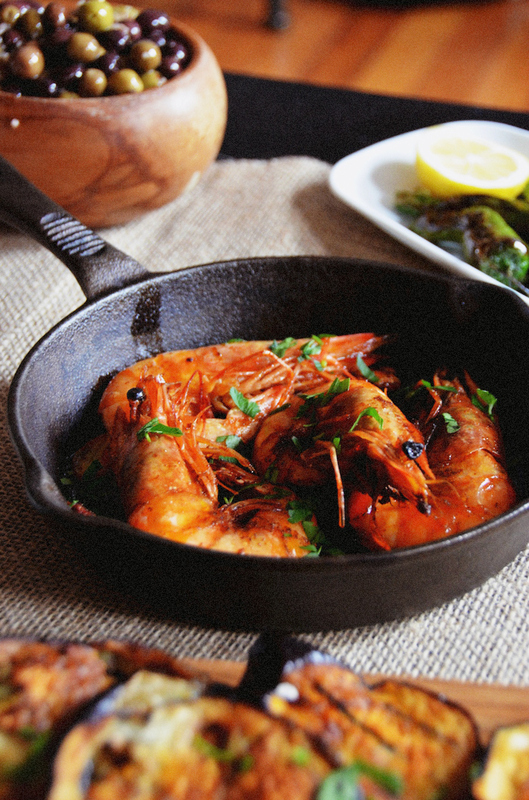 Gambas al Ajillo, or shrimp in garlic oil, is another classic Spanish tapas. This version adds chorizo and cilantro for an amazingly flavorful dish. Some roasted seasonal vegetables are always a good idea (and will help balance out all that cheese and cured meat!). Try this Spicy Roasted Eggplant or these Roasted Carrots. 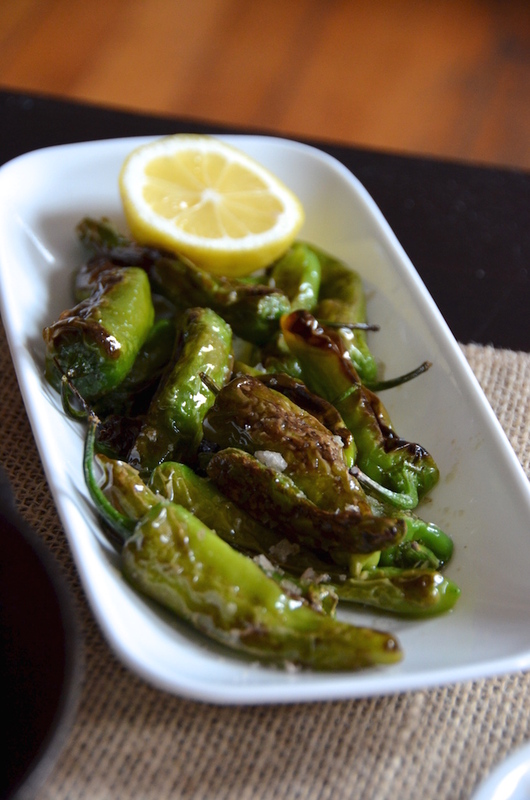 Blistered Shishito Peppers (or blistered Padron peppers) are salty and totally addictive. 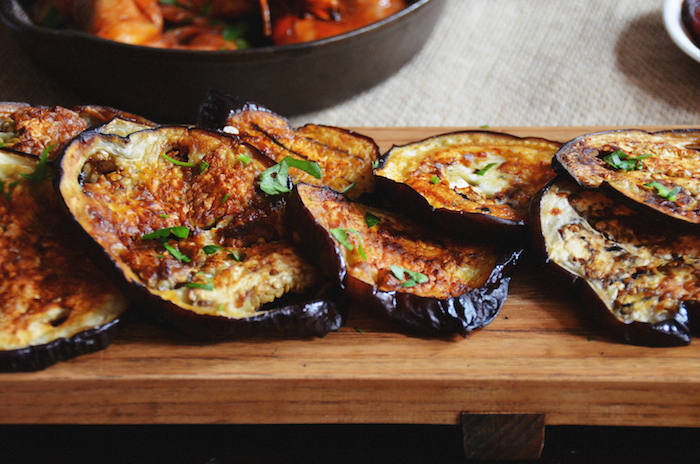 This is another quick recipe that's perfect for sharing with a glass of bubbly or red wine. Another classic? Tortilla Española! Also known as Tortilla de Patatas, this Spanish potato and onion omelet is amazing and is best enjoyed at room temperature. You can make a plain version with just potato and onion, or add manchego cheese and chorizo to spice it up! Finally, add some olives (I love these orange marinated olives!) and crackers or good crusty bread. 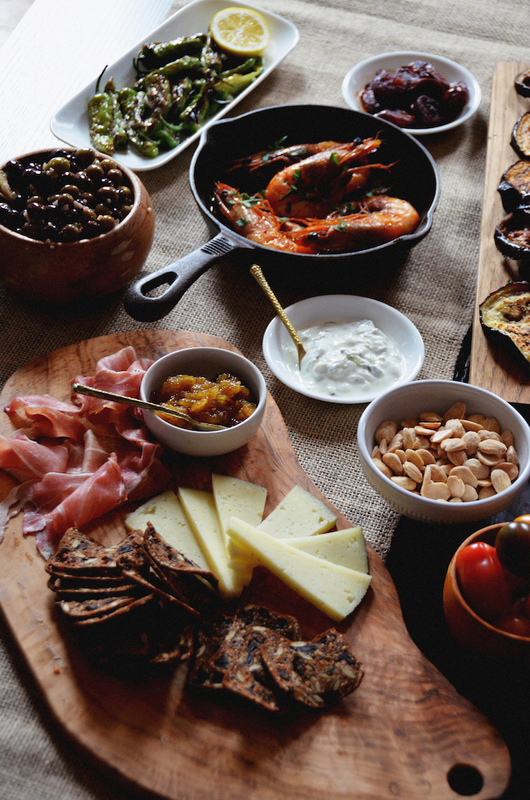 Open up a bottle of wine, and get ready to enjoy your cozy tapas party at home!